Beginning in August 2018, Thatcher Schools has partnered with A'viands to provide school meals to all students in grades K-12. The prices for PAID breakfast is $1.75 per student. The prices for PAID lunch is $2.75 per student. Reduced price for breakfast is .30 and .40 for lunch for students who qualify. The price for an additional milk will also remain the same at .30. If you have questions, please call the district office at 348-7201. To access the free and reduced lunch application, click here. Nut allergies are increasing throughout our District. The cafeteria is no longer serving nuts or nut products as part of the breakfast/lunch programs. 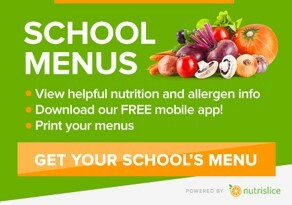 If your child has a nut or other food allergy, please notify your child's school office and ask them to notify the cafeteria of this allergy too! Thank you! The cafeteria staff begins their day at 6:00 am, to start preparing food for the day's meals. Breakfast is served from 7:00 am until 7:50 am. The cafeteria operates on all regularly scheduled school days, Monday thru Friday. On early release days meals are served to all students K thru 8. Lunch is NOT served at the High School on early release days. A sack lunch will be available, by request only, for High School students on early release days. High School students requesting a lunch for early release days must notify the High School Cafeteria Cashier 2 (two) days in advance, give their name for payment or prepay the sack lunch. No refunds will be given for sack lunches not picked up. High School students are prohibited from coming to the Middle School Campus or Middle School Cafeteria at lunch time." Lunch starts at approximately 11:00 am and runs through 1:10 pm. Different grades arrive at different times staggered through out this time period. Following lunch, final clean up is completed for the day. The staff leaves between 1:30 pm and 2:30 pm depending on their shift, and the cafeteria is closed for the day. Thanks for visiting our home page. We hope you found it informative and helpful. Feel free to stop by the cafeteria any time and see our operations. Our staff does a GREAT job and are dedicated to serving your children a quality meal, prepared in a clean, safe, environment and served in a pleasant atmosphere.